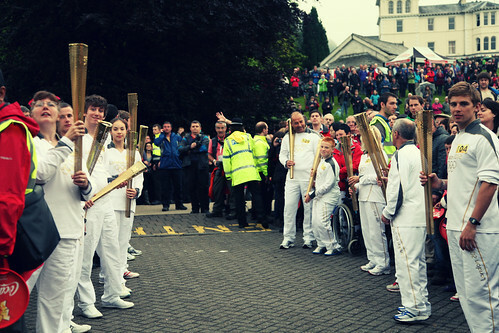 On 21st June, Beatriz, Ethan and I spent a day following the Olympic torch down from Dumfries in Scotland to Bowness-on-Windermere. It began at 745am on a cloudy, grey morning and that turned out to be the best weather of the day! 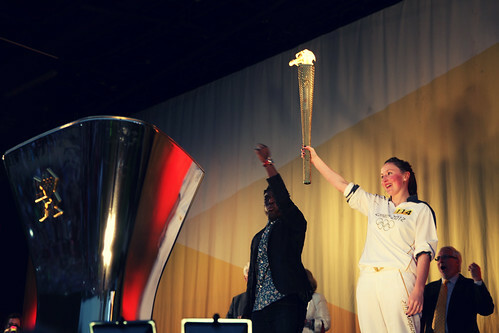 I was accredited by LOCOG to be with the team and spent a reasonable proportion of the day around the delivery team, talking to torch bearers, police officers, and the Torch entourage (sponsors, crew, etc) about their experiences. One of the most overwhelming take home messages from a range of people I spoke to were complements about the Metropolitan police officers involved. I wasn't expecting to hear this, especially as the presence of security is often seen as a negative aspect of the torch. However, people in the crowd and around the staging of events only had positive things to say about them and my experience reinforced this view. I spent quite a bit of time talking to officers in detail about their experience. One of the team told me that they are 'all runners' and that, when they are assigned to running for the day - sometimes they are on bicycles - they cover approximately the distance of a marathon. They work on a 4-week rotation, which meant they recently had a 4 day break and are due another in early July. 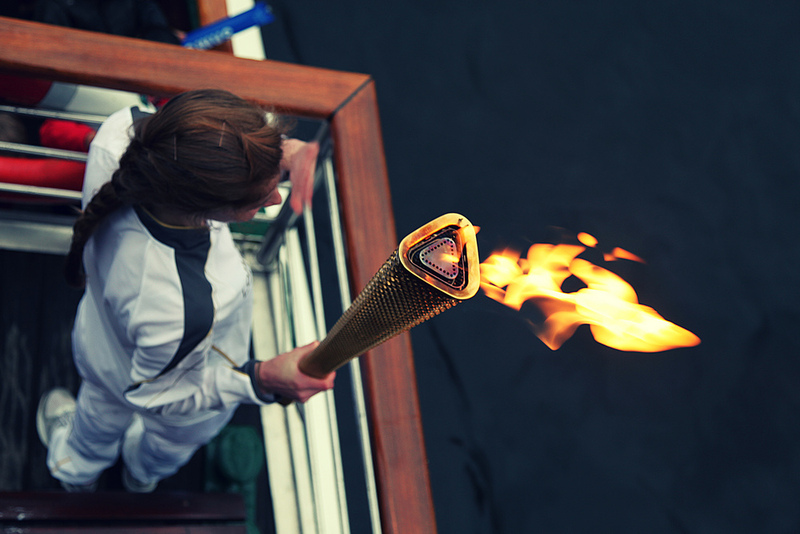 One officer explained that it was very difficult to be away from the torch for that length of time and there was a real sense of emotional attachment to this assignment. 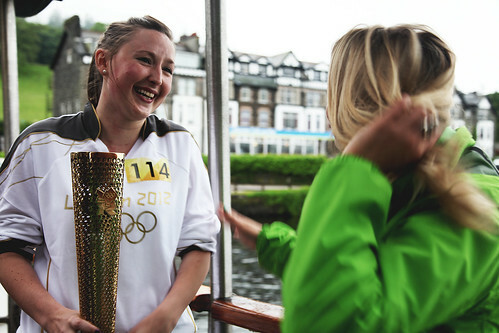 On the boat from Ambleside to Bowness, the team had around 1 hr when they could relax a little and talk more. 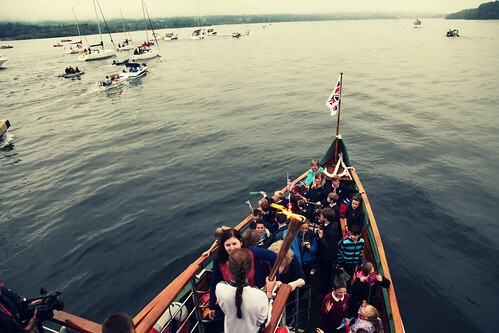 The bow of the Tern, as it progresses on Lake Winderemere to Bowness. At any one time, there are 2 pilot light flames accompanying the lit torches and the lanterns - traditional mining lantern designs - and a further 4 lit pilots on the bus. These lanterns stay with the officers 24 hrs a day. They even sleep with them I was told. Throughout, it was apparent how the officers were constantly focused on the torch bearer's experience and I was surprised at how personable they were. Some of the photos I took convey this well. I didn't ask if they had received media training, but they were certainly very human in how they related to those people who entered their inner circle and very well versed to speak to media. I was with them at the half-way point in the relay, so I think they probably had answered the same questions 100 times by then. Even the Olympic sponsors who were with the team confounded my ideas about how they may simply devalue the Olympic symbol. 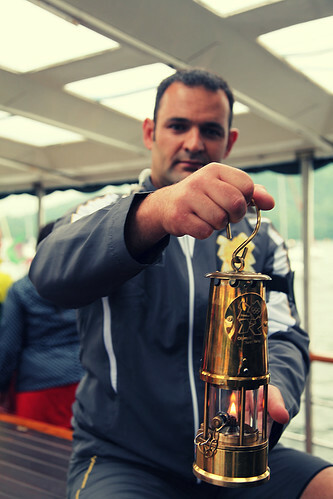 While people on the ground reported how the sponsors may have trivialized the experience at the evening events, on the boat, the sponsor reps spent time talking to the torch bearers, explaining the history of the torch design and seemingly trying to enrich the torch bearer's experience of their brief time with the team. 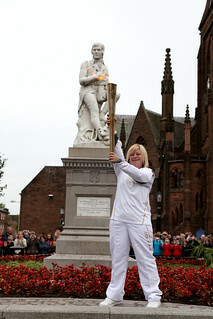 At the same time, the VIPs who found themselves around the torch were really not placed centre stage. If anything, they were relegated and given reasonably short shrift in the experience, which was quite heart warming. When starting out on the day, I was not sure how or what I would report, but the story turned out to be the entourage around the torch bearer and the experience within that quite tightly constructed bubble where the performance of the relay is delivered. 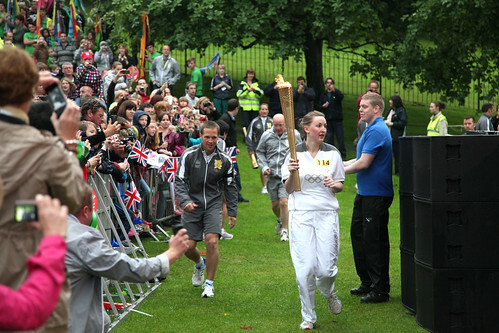 It is a place of considerable collaboration between the police, LOCOG, and the crew, along with the local teams that must work with them to ensure everything stays on schedule. I'm sure I would not like to have got in the way of their work - one of the official photographers did bump me out the way at one point when I got in his shot, but that's not unusual - and I'm sure there are some who have felt the wrath of this team - and the wider police work around the torch - at key moments when the torch may have seemed vulnerable. I was also surprised that this turned out to be my story of the day, as stories about the police around the torch historically are more critical than anything. However, when all goes well, people in the crowd conveyed to me how they felt the police helped to make the experience memorable, in a good way. 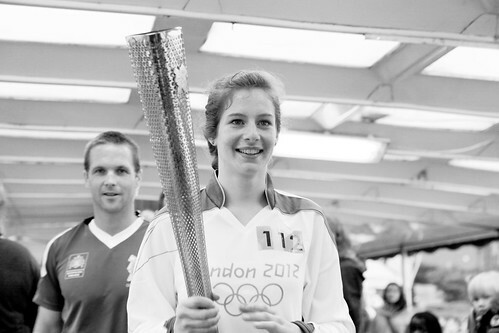 Nevertheless, I think the torch bearers themselves were the main beneficiaries of their conduct.